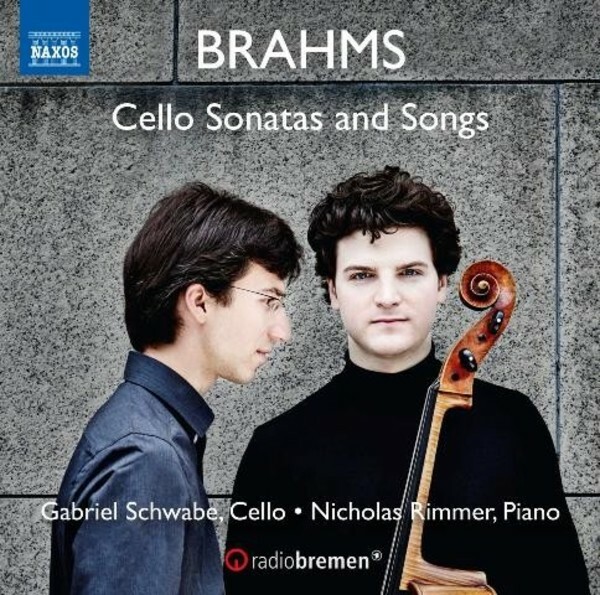 A period of twenty-one years separates Brahms’ two Cello Sonatas. Suffused with lyricism and expressive ardour, the First has become one of his most popular chamber works. The Second is more sober and succinct than the earlier work, yet strikingly original, not least for the wide range required of the cellist to reach unusually high notes from the very low register. Chosen to suit the cello’s particular colour and articulation, the six songs are heard in idiomatic and sensitive arrangements which stay as close as possible to the originals. Gabriel Schwabe has established himself among the leading cellists of his generation. He is a laureate of numerous national and international competitions, including the Grand Prix Emanuel Feuermann, the Concours Rostropovich, and the prestigious Pierre Fournier Award. As a soloist, he has performed with orchestras such as the Philharmonia Orchestra, London, NDR Radiophilharmonie, Berlin Radio Symphony Orchestra, and the Adelaide Symphony Orchestra. In 2010 Gabriel Schwabe gave his recital début at London’s Wigmore Hall. He studied with Catalin Ilea in Berlin and with Frans Helmerson at the Kronberg Academy, and received further stimulus from János Starker, Gary Hoffmann and Gidon Kremer. Nicholas Rimmer has appeared at major venues such as the Wigmore Hall, Tonhalle Zurich, Berlin Philharmonie, Laeiszhalle Hamburg and the Gasteig Munich, and has performed as a soloist with the NDR Radiophilharmonie, the Hamburg Symphony Orchestra and the Heidelberger Symphoniker. This is his second recording for Naxos following his acclaimed recording with Tianwa Yang of the complete works for violin and piano of Wolfgang Rihm (8572730), which received a Diapason d’Or, a Pizzicato Supersonic Award and an International Record Review ‘Outstanding’ Award.